Lauren Griffith-Mackey, who passed away in May 2017, suffered with Learning Differences (LD) and Mental Health Issues. Her needs were complex but the level of care that she received throughout her life was very good. The care that support workers provide within the home is usually driven by their desire to make a difference to the life of those who they are looking after, but there is a complementary need to access activities outside of the home. Ideally this should be part of any daily plan so that people like Lauren have something to look forward to and therefore make a difference to them and their well-being. Our aim is therefore to provide a community centre to benefit the residents of an area of Lancashire to be used primarily, but not exclusively, by those with learning differences or mental health issues, with the objective of improving their well-being. The centre will provide recreational and educational activities allowing them to grow to full maturity, try out new facilities and activities, and stimulate their own learning and development as they wish. The ultimate objective will be to encourage integrated care and action between all users of the centre enabling a cross fertilisation of understanding for the benefit of all. The methods to achieve this will be reviewed continuously through analysis and evaluation of our practices in line with professionals’ opinions and on judging what works and what doesn’t. The centre will be a direct memorial to Lauren's spirit and tenacity. The organisation was established as a Charitable Incorporated Organisation (CIO.) on the 7th February 2019, (registered charity no. 1181919). The first Trustee meeting was held on the 14th September 2017 but since then the governing structure has been revised to enable it to be more robust for future sustainability. Various meetings have taken place with Preston, South Ribble Borough Council (SRBC), and Lancashire County Councillors as well as with the local MP Ben Wallace who has pledged to support the project and will remain involved. Locally we have had advice from a variety of organisations in the third sector and attended many seminars in order to increase our knowledge and extend our contacts. We continue to look for either a piece of land as a potential location for the Community Centre, or an existing building which can be converted and developed. However, we are keeping our options open and will consider all opportunities that come our way. Our vision is a work in progress but in November 2018 we saw our first major milestone - the opening of a drop in centre at Sion Park Community Hub Preston. We held sessions for Arts & Crafts, Music and games which ran until the week before Christmas. We then moved to the Plungington Community Centre. 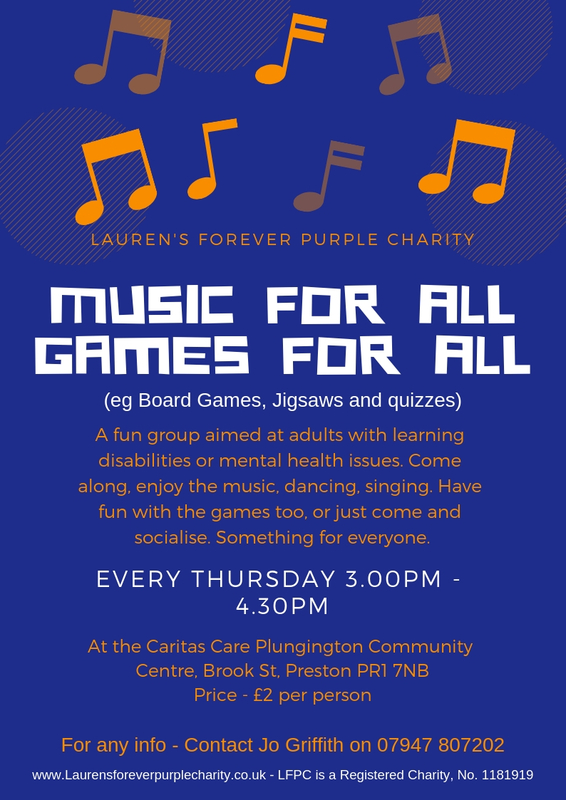 Here we run a session every Thursday afternoon from 3pm to 4.30pm (see details below). This session will serve the people of the area but gauge the need for this kind of service and establish our charity in a small but beneficial way. 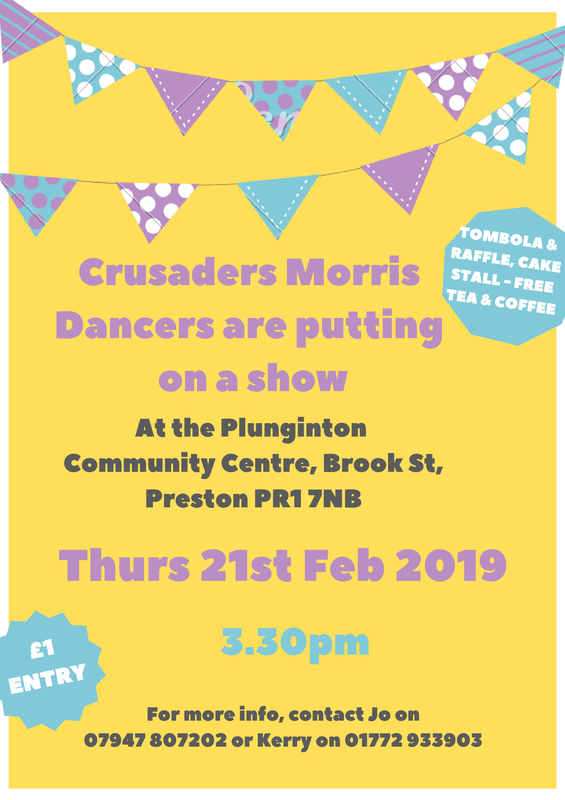 On 21st February the Crusaders Morris Dancers put on a show for us and a good time was had by all. 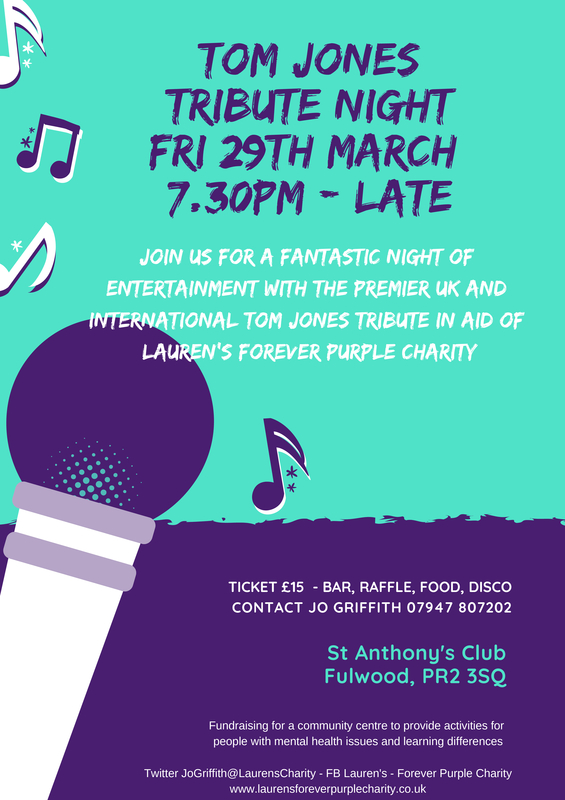 On the 29th March Ian Anthony performed for us as the UK's No.1 Tom Jones Tribute Act, at St Anthony's Social Club, Fulwood. A great night was had by all and Ian was superb as Tom Jones.